US, 1940, 88 minutes, Black and white. Lewis Stone, Mickey Rooney, Cecilia Parker, Fay Holden, Judy Garland, Ann Rutherford, Diana Lewis, George P. Breakston, Sara Haden. 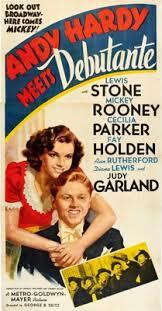 Andy Hardy Meets Debutante is the ninth in the Andy Hardie series. It is the eighth for Lewis Stone as Judge Hardy (Lionel Barrymore appearing as Judge Hardy in the first film, A Family Affair). All the films in the Andy Hardy series were directed by George B. Seitz, which means that the cast were at home with the director, at home with the story and their characters – and able to engage the audience in interest in the series. While the stories are from the 1930s and inhabit that world, they are still in many ways relevant to the issues of adolescents and parents, even though the style of interaction with parents is so different in later decades. Lewis Stone is always wise as the judge, Fay Holden always fussy and anxious as Mrs Hardy. Mickey Rooney is at ease in the role of Andy Hardy and the various troubles he gets into? This time he is infatuated with the pictures of a debutante in New York, pretends that he knows her, which is taken up by the editors of the school paper (Ann Rutherford, his usual girlfriend, Polly Benedict) and Beezy (George P. Breakston). Because of problems in an orphanage, Judge Hardy goes to New York to deal with the benefactors. Andy goes to New York, initially unwillingly, because the editor is going to put his photo on the paper, with the debutante. In New York he does try to meet the debutante but is genially moved on by her mother. In New York, he teams up with Betsy Booth (Judy Garland) who had lived in Carville and appears in two other of the Andy Hardy films. In the end, she knows the debutante, arranges for Andy to go to the party, to dance with her, to have a photo taken. In the meantime, Andy gets into all kinds of trouble, borrowing a tuxedo, gatecrashing a party, taking advice that he should have the house specials at the restaurant, building up an enormous bill, getting into trouble with the manager – who discusses things with Judge Hardy, hoping that Andy will learn a lesson. Andy at this stage of his life is also very snobbish, wishing his family could be wealthy. However, he sees his father achieve a victory in a court and the respect given him and he comes to his senses, more or less. One of the main benefits of this film is the performance by Judy Garland, always a strong screen presence. She has an opportunity to sing Alone (Alan Jones’ song from A Night at the Opera), even with a touch of irony and, at the debutantes’ ball, she sings I’m Nobody’s Baby. 1. The durability of the Andy Hardy series? In their time? Echoing the 1930s and 40s? Family values, issues and problems? Their relevance to later decades? 2. The director and his directing the whole series? The cast and their being at home in their roles and situations? The black and white photography? The city of Carville? The contrast with New York City – and the sightseeing scenes, especially the Empire State and the Statue of Liberty? The musical score? Judy Garland singing? 3. Andy, his age, the infatuation with the girls, cutting out photos, his album? At school, with Polly Benedict, being snooty? His claiming to know the debutante? Their threatening to put him on the cover? His anxiety? Going to New York, his trying not to go, turning the clock back? His father’s stern orders? In New York, in Betsy Booth’s apartment? His alliance with Betsy? Discussing Polly Benedict? Getting Betsy’s help, the taxi, going to the building, getting into the room with the debutante? Her mother easily urging him out, the reaction of the staff? His being infatuated? The plan to go to the party, the tuxedo, the diamond stud, dressing up, the top hat, the restaurant, the advice to have the house specials? His eating them all? Refusing to buy the dog for twenty dollars? Discovery of the truth? His confession, his being miserable, the owner and the waiter? His going home? Moody? Talking things over with Betsy, honestly? Discovering she knew the debutante, the phone call, going to the party, meeting her, meeting her mother, dancing, the photo? Going home? His love for Betsy? Meeting Polly and Breezy? The photo? 4. The clash with his father, his snobbery, wanting to be rich, celebrities? His father’s patient reaction? Finally persuading him that he has been wrong? Judge Hardy’s situation, the orphanage, the little boy (and Andy thinking he was a little girl)? New York, the court case? The issue of the bonds, finance for the orphanage? Mother and her fussiness, her comments at the Empire State Building, the judge realising the point of law he could use? In the court? Winning his case, the orphan coming in and testifying? The lawyer being agreeable? The judge and his praise? Andy and his admiration for his father? 5. Mother, her fussiness, worrying about the gas...? Aunt and her buying the fur for her sister-in-law? Andy seeing his father wearing the fur? 6. The Hardy family? Middle America? The values and questions of the time – and now?